He’s disarmingly genteel, light, an effortless conversationalist, and endearingly candid. Like if Katy Perry and Prince Eric (from The Little Mermaid) had a lovechild. It’s official. Andrew Brischler is the closest thing you get to saccharine with a pulse. Yet, with razor-sharp execution, his paintings and color-pencil drawings are raw, undulating, boldly unflinching glimpses into the visual modalities with which we process words and shapes: loud colors, geometric tessellations, and surreal motion. Brischler is represented by Sarah Gavlak, between her two galleries in Palm Beach and Los Angeles, respectively. His work has been seen at venues in Cologne, Miami, London, Los Angeles, New York, and Rotterdam. Ahead of his double solo Lonely Planet in both of Gavlak’s locations, Brischler spoke to me from his studio in Brooklyn as I was situated at my base in Siena, Italy. Interviewer’s note: This interview has been condensed for brevity and clarity, and is by no means a comprehensive sample of the wide-ranging, often very personal conversation between the interviewer and the artist. So tell me about your text works, straight out of grad school. The first time I saw one of your text works was at [Art] Basel, in Miami, but that was one out of a series of abstractions. I’ve always used text. I’ve incorporated text since undergrad, but I never really gave myself permission to use it in grad school. Since then, though, everything that I do now is colored pencil, everything that you see are all done with color pencil. My last show for Sarah in Los Angeles in 2015 was called Storms. It was the first show that I did that was entirely drawing: on paper, on panel; and in that show I started to put abstraction right up against appropriated text. That was something really interesting to me because it sort of grounded the text in this world of fine art, it butted the history of abstraction right up against this world of commercial design. My first favorite artists were Saul Bass, Kurt Schwitters – I was obsessed with movie posters when I was in high school, obsessed with title design from horror movies. Text has always been something that’s been synonymous with image to me. A rule that I made for myself after that  show was that if I was going to us text, it was going to be my own design. Text is so rich, like this formal puzzle: I think of a word, the word or phrase sits in my brain and I have to think about what font and color will go with the right word. It’s an endless, beautiful exercise that I’m doing. Once I gave myself permission to see text as the project, not just a component to an abstract project, that’s really when the work started to get cooking. Talking about intertextuality, it’s often thought that certain works have dialogues within one another and between one another, respectively. It’s hard for me to divorce any textual artwork now from the political ambience of where we are – how words are becoming increasingly suspect. I find that with your w ork, with the interchangeability between word and gradient and design, that it’s becoming more important to incorporate them. Otherwise, one loses the other. If that makes any sense. It does make sense. You know, talking about politics and this sort of political atmosphere: on November 9th , I had to come to my studio because I had a delivery, and it was very hard to get out of bed. But, I got to my studio and some of the work that was going to be in [Gavlak’s] Palm Beach show was already finished. An earlier version of Constant Cravings was already finished, a different version of Paradise had already been created, and when I got to the studio, all of the words took on a different meaning. They took on this darker meaning. I have another piece that I’ve been reluctant to show just yet, it just says Heresy splattered across the panel. I made that a few days after Trump was elected. To answer your question, I think what you were asking is – does abstraction and text need to be linked? Not need to be linked, but do you find that that’s occurring now more than ever? Yeah, I find that they’re one and the same. Now I’m just starting to find letter forms – I never really considered myself an abstract painter. It’s an easily digestible word to put my work in, but I’ve always been painting stripes – stripes are things. I’ve always been painting spirals – spirals are things. There’s always been a grounding image to all of my work. All those tenets of formal abstraction were vehicles to get to meaning. Now, the vehicle is the word. I’ve always been interested in work that talks back to me (to be really literal about it). Let me explain. When I go up to a piece of work, there’s an agreement between myself—the viewer— and the piece as a work of art. The words, for me, make that agreement all the more loaded. What is the viewer bringing to that word or phrase? What am I bringing to that word as an artist? How does my intent compare or contrast with the viewer’s ultimate experience. For Example: Constant Cravings is a K.D. Lang song. It is deeply rooted in my coming out process and my idea of who I am and who I was as a little gay teenager. But ultimately, I don’t care if people see that. What I do hope comes through is the notion of longing—a void reflected in the concentric circles around each of the letters. The words, fonts, and design all have to be in service of the content, you know? In tandem...are words weapons or victims? (Laughs) Gimme a second. Well, I mean right now, they’re weapons. In a lot of ways. Weapons, at their core, are tools. I’ve always seen words as tools. So, I don’t see my words that I use as specifically weapons or victims. I just see them as tools. But, right now words in the U.S. are weaponized every minute of the day. But because of that, I think – the respect that I have for words, the deep love I have for word choice, that’s being victimized. It’s hard to not feel victimized right now. I went to therapy the week after Trump was elected, as most of the people in my life did. Something I talked about in therapy was how helpless I felt, and how victimized I felt. I’m thirty years old and I grew up thinking that progress was linear. I thought we had gotten to a point [of] social progress in this country, and there was no way that could be turned back. That is an extremely naïve way of thinking, but I grew up with a progressive, black president for the entire time that I have been a thinking adult. I have found that I’m not a natural activist. I’ve never been a macro, large-scale activist. What I have felt, deeply, since November is on the micro-level, how do I bring joy to my life and to the lives of others around me? What can I put into the world that tells my story? Once I situated the work in that lens, the work has just flown out. I’ve been coming up with more phrases, and more words than I ever have in the past year. I just made a drawing for an upcoming project in March that says Thunder In Our Hearts, and that’s triumphant but also weaponized. It’s a balancing act, but one that’s really fun. Which artists are you close to? If that’s something you’d like to discuss. Personally, one of my favorite artists is Ellsworth Kelly. I’ve always seen his work as extremely gay. Or, extremely queer. You know, a lot of those shaped canvases that he made were from shadows that he took pictures of in Spencertown, New York. There’s something so queer about taking an empty-arc of dark, negative space and turning it into this brightly- colored jewel on a wall. There is something so transgressive about that. Do you think that was the beginning of the way you gauged friendships with artists in your life? Sure, yes. But to bring it back to my love of Ellsworth Kelly for a second. At the end of 2015, I had this HIV scare.The partner that I had had eventually tested negative, but I had not been tested yet. I went home for Christmas, and that giant red monograph Phaidon put out of Kelly’s work had just come out. My dad got it for me. Kelly died two days after Christmas that year. I had been reading about the shadows and the photos he took. When I went to my doctor to get my test results at the beginning of January, I was sitting in the waiting room, I looked at the vertical blinds in the waiting room that were making these knife-edge shapes. I took a picture of them and made these ten little studies on graph paper in two colors in my studio that afternoon. It’s the same impulse that Kelly had making those shaped paintings. 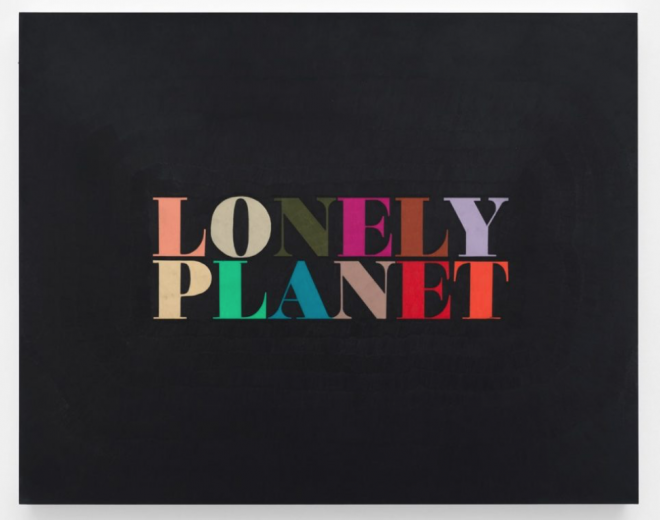 That’s why the [new] shows are called Lonely Planet; it’s the title of a play that was made in the early 90’s about the AIDS crisis, about anxiety and feeling helpless. To answer your question about friendships: a lot of my friendships in the art world are with women and queer people. Not necessarily people that make overtly queer work with a capital “Q”, but we all have this camar aderie of feeling somewhat like the “other." I’m sure it also reminds you of how futile the idea of language is. Because you can connect with people in very different ways. I think about that all of the time when I’m making my work. The work is in English, and I kind of like the futility in that. If they [the viewers] can’t understand the work, they still have to think the object is beautiful, or compelling. Is it possible that the words become ciphers? What do you think is the next perceivable plateau or platform for you? Like a Tower of Babel? Precisely. This salon wall – some drawings take me five days, some drawings take me an hour. It’s a way for me to work ideas out, a way to explore fonts. I’ve talked to people about making light boxes with words, making neons – that’s something I’d like to explore down the road. But for now, I’m so devoted to drawing, to the time it takes me to do it by hand. Drawing—conceptually and literally—is just constantly expanding.